It's fairly easy to find capable Ultrabooks priced below Intel's recommended $1,000 ceiling, something that was a bit of a challenge when the form factor first emerged. Pricing has trended downwards for the past several months, but don't be surprised if some next generation Ultrabook models reverse that trend due to higher quality displays with touchscreen functionality and 3D support. a given, with Microsoft's Windows 8 right around the corner, but apparently Intel is also pushing for 3D displays. According to Digitimes, this is one of several suggestions Intel is making to Ultrabook makers in preparation for refreshed models built around the chip maker's upcoming Haswell platform in 2013. 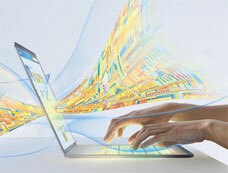 Intel would also like to see tomorrow's Ultrabooks boast high definition screen resolutions. For the most part, Ultrabook makers have appeared hesitant to venture above 1366x768 up to this point, even though the hardware is is plenty capable of driving Full HD 1920x1080 displays. Other ways in which Intel would like to see Ultrabooks evolve include better security measures, improved chassis design, longer battery life, and the return of solid state drives (SSDs) as a primary storage option.